Dark circles are the bane of my life. Unfortunately for me, they’ve started getting more prominent over the last 5 years and now I’m at a stage where if I don’t cover them up someone will definitely ask me if I’m feeling OK or if something is wrong or even worse tell me that I look really sick/tired. Due to being South Asian, dark circles are very hard to get away from. They’re hereditary so it’s not always down to lack of sleep or water. For me I think my sinuses do play quite a big part in it too and having really thin skin doesn’t help either. Tis the hand that I’ve been dealt so I’m now on the hunt for some correctors and concealers. For a long time I’ve just got by by doing an OK job of covering up my dark circles a little bit, but in all honesty I had no idea what I was doing. Then yesterday, since I was feeling really lazy and didn’t want to get out of bed, I spent hours watching makeup tutorials to find a method of concealing that would work for me. By the end of the day I was well equipped with all the knowledge on colour correcting and beauty blending to erase that under eye baggage. 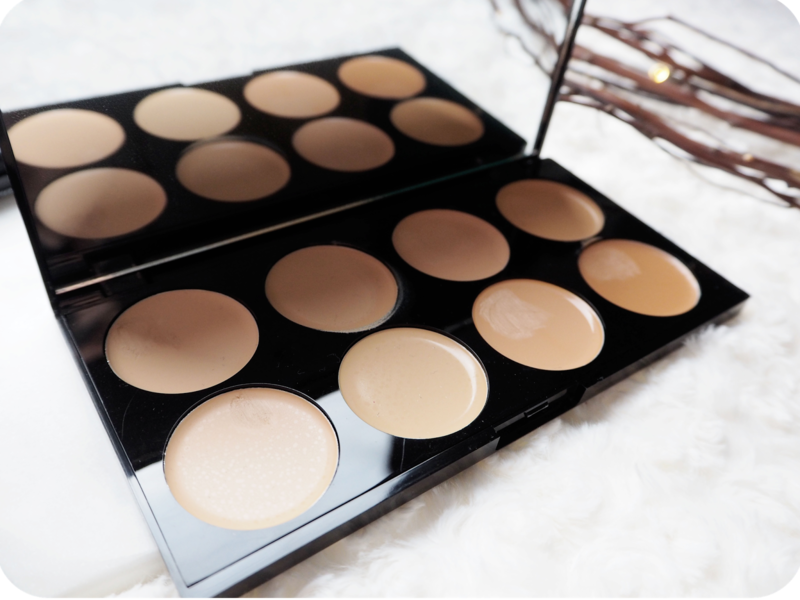 Since I was still in my PJ’s and there was no way that I was going to go out to buy some new products, I decided to test out the Makeup Revolution Ultra Cover and Conceal Palette that I had bought a good few months ago and never really got round to using. I’m always a bit unsure about Makeup Revolution (I mean, why is it so cheap??) but for £6, I would be insane not to have at least tried it. Even if I got a few uses out of it I’d be happy with that. Having dug the palette out again from my makeup stash, I gave it a good old inspection first. On first impressions I actually loved how the palette looked. It’s a shiny black case which admittedly takes a bit of work to pop open. This isn’t a bad thing at all though because if I’m carrying my makeup around, which I often do, I don’t want it to be coming open in my bag. Inside, there are 8 pans that look really creamy and quite shiny and there is a mirror in the lid of the palette. The high shine does worry me a bit as shiny under eyes aren’t always a good thing but I thought I’d give it a go before I judged it. On a quick side note, it really bugs me when makeup palettes come with a crappy mirror inside a palette because they’re just useless but Makeup Rev have used an actual mirror as opposed to some cheap reflective stuff so very impressed! I grabbed my concealer brush and swiped at the pan with the most orange pigmentation, to start colour correcting. They don’t have names so I can’t tell you which shade it is but it’s the one at the bottom right. The creamy concealer melted as soon as it was touched and came straight on to my brush so this really excited me. Now for the real test though, how well would it sit on my face? As I brushed it on to my face it did transfer well initially but as I used my brush to pat it on it was coming back off my face and on to the brush. Clearly this wasn’t going to work for me so I tried using a damp beauty blender instead. I still had the same problem and it was getting increasingly frustrating. For the purpose of this review I persevered though and a good twenty minutes later I had corrected and concealed my under eyes. As I had suspected earlier, it was extremely shiny under my eyes so after a couple of minutes, I decided to put some translucent powder on to matte it out a bit. Huge mistake! As soon as I took a brush to my under eye area the product started sliding around my face again. In the end I just did the best that I could and waited to see how well it lasted. I continued on with what I was doing that day and after about an hour I went to see how well it was doing. I looked in the mirror with the best lighting in the house and my goodness my makeup looked awful. There was so much creasing that I looked ten years older than I do and the product that was on my face just wasn’t thick enough to stop the darkness from showing through. I was so horrified with the makeup that I didn’t take any pictures. 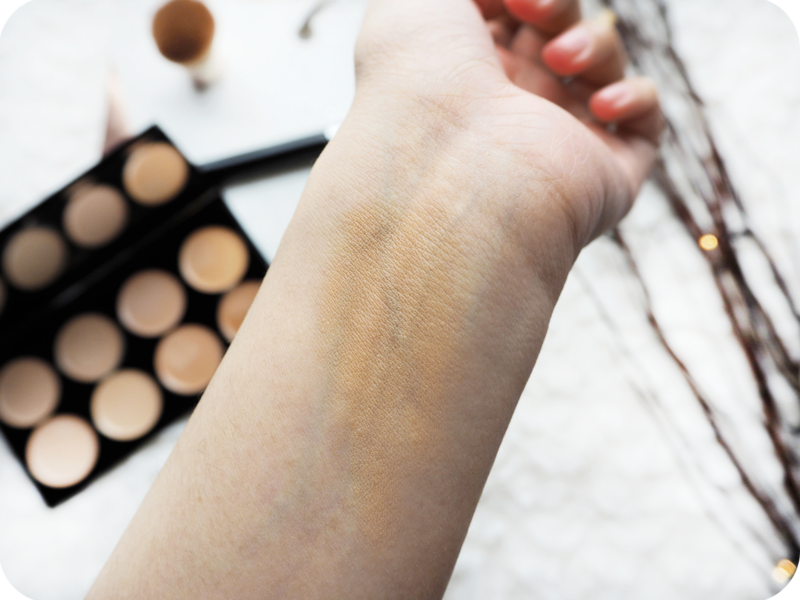 I did want to show you just how awful this palette is at covering any blue/purple darkness you might have under your eyes so I’ve used the palette to conceal the veins on my wrist. You can easily see in the picture above, that even after about 5 layers of the darkest shade over my wrist, it doesn’t cover the blue veins at all. The colour just shows through. Sadly this was the same case for under my eyes and as you can imagine I looked pretty awful. I definitely won’t be purchasing this palette again. Perhaps if you have barely noticeable dark circles, this product may work for you but for us girls who have serious suitcases under our eyes it’s a no no. 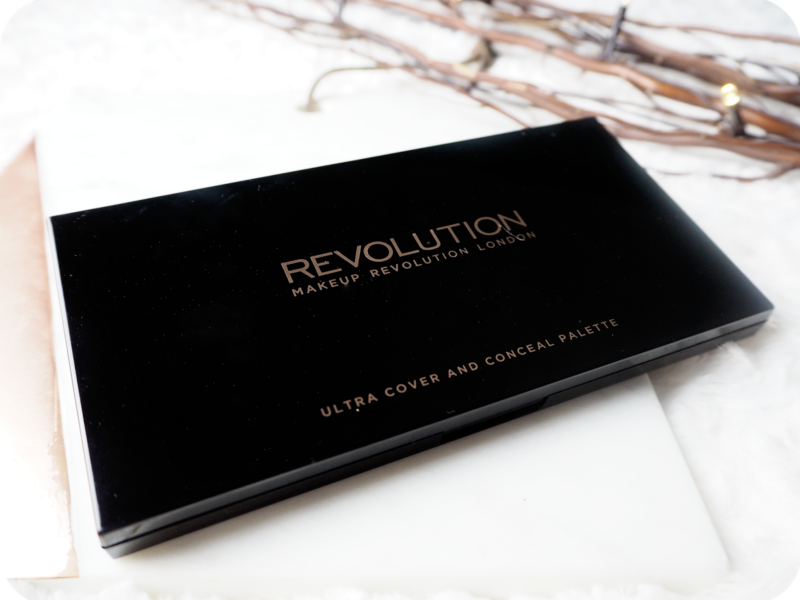 Make Rev’s Ultra Cover and Conceal palette neither covered nor concealed my dark circles. Oh dear. What products do you use to cover and conceal?